This post is sponsored by Playtex. All opinions are mine! When I taught kindergarten a few years ago, I would be asked time and time again by parents on how to get their child adjusted to kindergarten. After all, it is a LOT different than preschool. My son just started kindergarten and I am now experiencing what these parents were talking about. A lot of these tips can be applied for all school aged children (and my fellow teachers). The first and foremost thing is to be sure that your child is getting enough sleep. Did you know that 5 to 6 year olds need 11 to 12 solid hours of sleep? Sleep is essential to learning, it promotes alertness, memory and performance. Children who get enough sleep are more likely to function better at school work and are less likely to have behavioral problems. And we all know how moody our little ones can get, sleep can help with that! Preschoolers nap in the middle of the day. For my son not having the nap is a huge adjustment and he will try to sleep on the way home from school. I try to keep him occupied by playing educational car games with him to keep him awake. If he falls asleep, he won’t go to bed on time. Secondly, be sure to establish a routine. Kids need to have a routine that makes them feel secure and helps them control themselves. Having a structure helps kids feel safe and ready for the daily challenges they will face at school. Children do best when routines are regular, predictable, and consistent. Practice the same activities in the morning before school, eat breakfast, talk about what they are going to do at school that day, and put them on the bus (or drive them) with a smile on your face. Kids need to have positive energy in the morning before school. After school provide a routine that includes homework time, play time, as well as family time. Speaking of homework, today’s kindergarten is not like what we remember kindergarten to be like. Expectations are through the roof and teachers are expected to have kids reading before they enter first grade. I have taught both kindergarten and first grade and I can tell you that if a student is entering first grade without being able to read simple books, they are behind. This focus on academics is a lot different than what our kids are used to in preschool. Now, I am not telling you to spend and hour every night on homework and reading (that isn’t developmentally appropriate), I am simply asking you to read with your child every single day. I love reading “night night” stories with my son and daughter. Having a routine of reading every night will instill in your child how important reading is. Finally, I can’t stress how important eating good meals are. My son only gets about 20 minutes to eat his lunch and often he doesn’t have time to finish it. I provide him with a snack after school (he eats it in my classroom) before we head home. I also make sure he eats a variety of healthy food for dinner especially foods high in protein. I can tell when he hasn’t eaten well the night before, he is usually pretty grumpy in the morning. I have loved being a contributor for the Playtex Baby Mom Trust Facebook page this year. I hope you continue to visit this wonderful resource for parents. You can read more about how other moms are adjusting their kids to school this year. What are your tips for adjusting your kids to a new year of school? « Anna, Elsa, Kristoff and Olaf are Coming Back to the Big Screen in 2015! Great post!! My boys both seemed to do really well in kindergarten – and we have full day here in my town. Phew. My kindergarten is having a hard time with how long the day is! He wasn’t a napper, but a full day is a long day! i also believe in giving them power of choice when possible. my kids are grade 4, 2 and K this year. I do a snack bin in the pantry and fridge on sunday nights, and the kids can choose whatever they want from those bins each day for lunch and snack. mine all go up to bed at the same time- while my 5 year old is asleep about 4 seconds after her head hits the pillow, the big kids are able to read in bed (lucky for me they love to) for a while. kids NEED routine for sure! Routine is very good. Great tips. We don’t have a kindergartner yet, but we’ve been making the adjustment back to daycare regular hours since my husband started the school year last month. Bedtime is ROUGH, but I think we’re finally getting back on our regular schedules! Kiddo did a pre-k/ young 5s group prior to K so she was really excited to graduate and move on to the next grade. That is neat that they got to ahve a little graduation to get them excited! Getting the kidlets into a regular routine again. also reading at bedtime – to calm them down and get their brains to relax! Great tips. My daughters are in 6th and 5th grade and we STILL have a routine of adjusting our schedules in the time before the school year starts. Routines are extremely important and like you, I used to read to my girls all the time. The main thing that works for my kids is a schedule and routine. They seem to appreciate knowing how each day is going to operate. I think schedules and routines are crucial for any child starting a new grade. Kinder can be so scary, getting to bed early is key for us. I’m so with you on the routine! Kids may argue about it, but they thrive on routines. Twenty minutes for school lunch is too quick! Yes, I don’t know what the school’s are thinking with just 20 minutes for lunch. That is way too short of a time span for them to eat at a proper pace and get all the nutrition for growing bodies and learning. These are all great tips. Adjusting to a new schedule can be hard for the little ones. I love these tips. My son had a somewhat difficult time adjusting to kindergarten. He was terrified that he wouldn’t be able to watch cartoons anymore. I was absolutely freaking out when I first started kindergarten. I thought I had to go 7 days a week, and I’d never be able to watch my Saturday morning cartoons again. I remember my first day of kindergarten. I adjusted very well, actually. I loved it. Establishing a routine is so important! My kids thrive on routine, especially at the start of a school year. A routine is also just as important for us adults. I get so much more accomplished when I have a set routine. As a parent I always e-mailed the teacher to ask for time when we could sit down and talk one and one either by phone or in person to talk about expectations and personalities at the beginning of the year. I found that paved the way to a successful school year so that we could early be proactive in certain situations. These are all great ideas. Adjustment can be hard sometimes! awesome ideas, my twins started kindergarten this year, luckily they both seemed to adjust immediately. 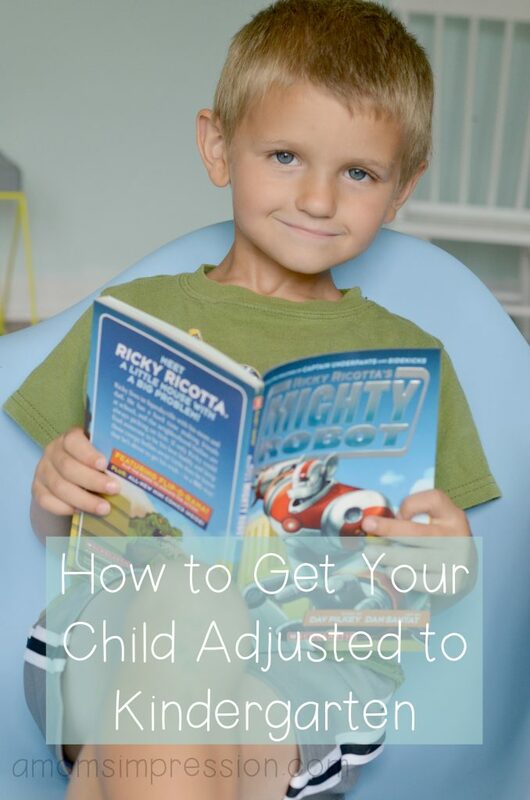 These are some great tips for helping your child get adjusted. It’s important that they can adjust and enjoy their time at kindergarten. Your son is so cute!! Great tips for going to kindergarten. Sleep is a definite must!! Great post! My son has been adjusting well this new school year. It’s a whole new world for us. I am trying to make the transition as easy as I can for him. Great post! We always talk about the previous year, and talk about anything they are worried about. I do my best to help ease that fear or answer questions… It’s always different every year and can be a struggle thats for sure! Sleep and routines are important for kindergartners. Reading to your child every day is good because the teacher will have daily story time. Kindergarten is fun when you’re prepared. Thanks for the tips. These are all great tips, my youngest did all day kinder last year and rocked it. I had issues with him in 1st this year though, separation anxiety out of the blue! I love that you are sharing this post with others, because I think this is something us parents have to deal with on occasion with our little ones! Great to have a supportive list of ideas to work with! No kids here, but as a psychotherapist I can attest that all of the ideas you listed are fabulous. Establishing a routine is just as important for parents as it is for the kids! Great post. I was lucky and my kids adjusted very well to school. I know some of the poor little ones have such a hard time. Reading is so important. My son was behind and we spent most of kindergarten playing catch up. My son definitely needs more sleep! He is up early and up late. It is important to transition them into that new phase. My kids did very well with the transition. We always made sure to go to back to school night. It got them familiar with the teacher and school before the big day. Those are some great ways to get your child adjusted to Kindergarten (or school in general). Meals and rest are definitely big ones for us! Starting a new school year is always a bit anxious, these are great ways to help make life easier for them!!! My son only gets 10 hours of sleep a night, and honestly, that’s a lot because he used to fight us and only get 8 hours at one point. It’s frustrating, and he’d be tired in school. He isn’t loving kindergarten yet. That’s great advice– thanks for sharing! Starting to get them on a routine early is really key! These are some really good tips. I have to say that my kids have struggled with reading, but amazingly they all end up getting caught up. I’m so utterly glad that my oldest is able to read now. I’m trying to get my 7 year old up to par. I hope that I don’t have that same issue with my 2 year old. They sound like books my son would have loved when he was younger. Yep, routines are crucial for kids in elementary school, especially. You have a cutie pie, there! Definitely enough sleep and a full belly is important for school. My daughter fights us to eat breakfast so sometimes that is hard to accomplish. We started early bedtime 2 weeks before school started. Other than that they were fine. I’m so grateful that our kindergarten is full-day, but the kids get a nap everyday. My youngest would not make it through the day without a nap. Great tips. It’s hard to help teenagers get enough sleep too.